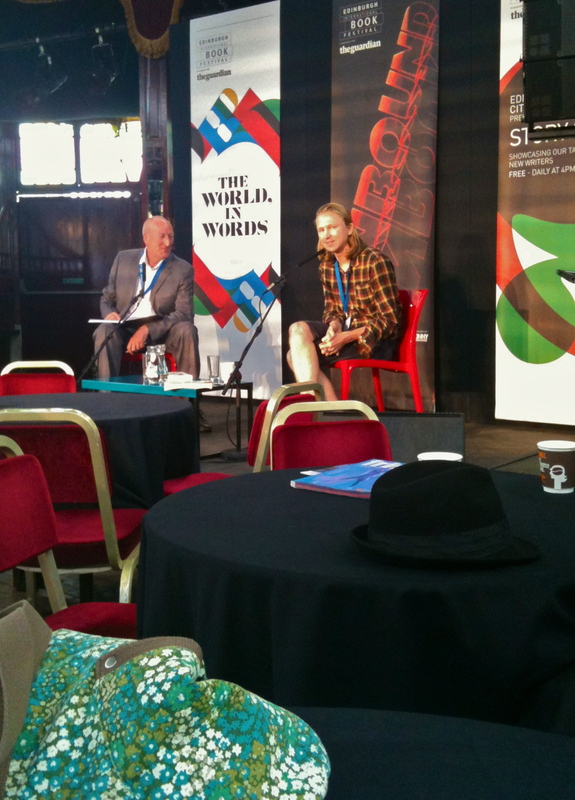 This morning I went to my first reading of the Edinburgh Book Festival, where I was greeted at the Spiegeltent by a man wielding free coffee. I have never been more pleased to see anyone – I really needed some coffee. I didn’t realize how much until I tried to milk it with another jug of coffee, at which point someone asked me if I was there from The Scotsman. I take heart that whoever is covering the book festival from there is as dazed and confused as I am first thing. Suitably caffeined I sat down to await the arrival of the author, Joe Dunthorne (probably best known for his first novel, Submarine, which was made into a film this year starring Paddy Considine and Maria out of the Sarah Jane Adventures). All around me people were reading; which is a truly beautiful thing but it made me feel like a bit of a freak because I was scribbling away in a notebook. In red ink, no less. I consoled myself with the fact that some of the best novels are written in red ink, even though I have no evidence to support such a statement. Then the man himself appeared, optimistically clad in shorts, and explained a bit about the reading he was going to do from his new book, Wild Abandon. The scene was based in a commune in the Gower in South Wales, he said, and contained a lot of different characters (as is the nature of such places). In the Q and A that followed, Dunthorne explained that this had actually been his second attempt at the difficult second novel. The idea for Wild Abandon, meanwhile, came from somewhere closer to home. He doesn’t plan his books, he says, because then he gets bored. The first story he told was in the form of a text based computer game he wrote at the age of 12. He got over it and went on to do an MA in Creative Writing at UEA, writing short stories and poetry before embarking on Submarine. One question that came up which I thought might be interesting to readers of this blog was whether or not doing a Creative Writing course is stultifying. When not writing novels, Dunthorne is part of Aisle 16, a group of poets who do various different projects including the Homework ‘literary caberet’ night in London. They try to engage in something a bit silly every year and at the moment are all working on becoming poet in residence at an unusual place – Tim Clare, for instance, is trying for the Weetabix factory.